A space that is often confined to function is the bathroom, and if not left bare, it is lazily adorned with framed photographs of family holidays or gimmicky postcards and prints in response to the notion of toilet humour. As bathroom enthusiasts, we regard the space very highly. After all, the bathroom is the only place in the house where you can go to be completely alone; unquestioned – a zone of total intimacy. So what better room to put thought into the design and hang your favourite works? As art too is appreciated on a very personal level. 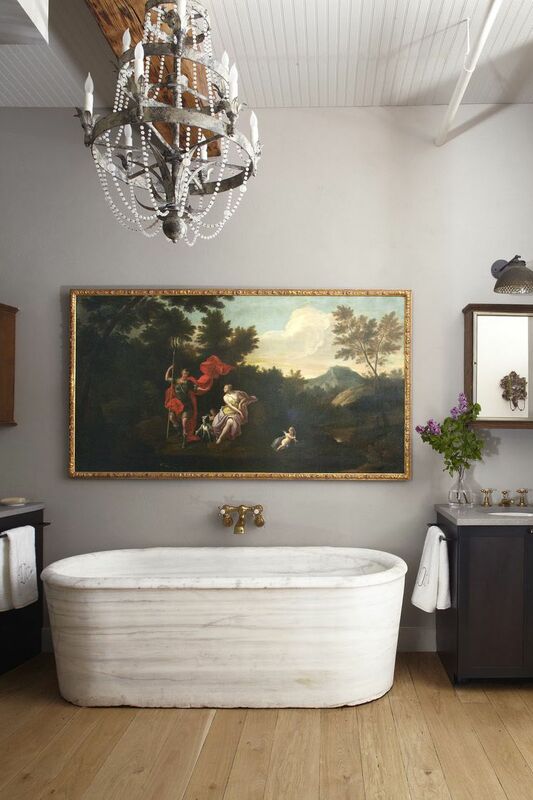 In the master bath of this downtown manhattan loft, owners Alice Childress and Christopher Daniels’ have boldly hung an inherited 18th century painting above their reclaimed marble tub. 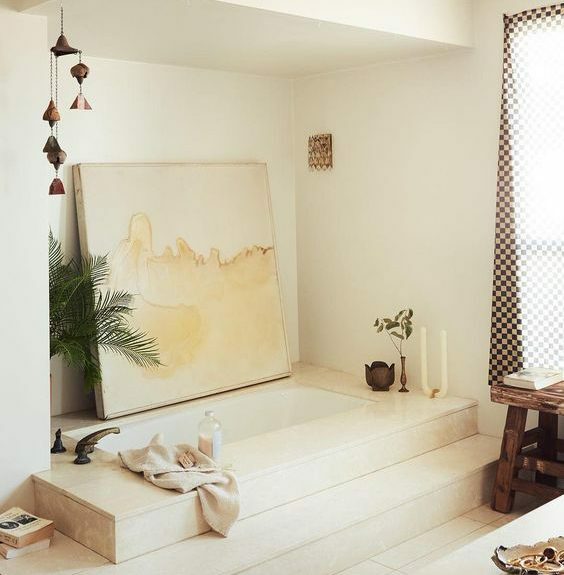 With help from designer Courtnay Daniels Haden, the homeowners have artfully combined the usual focal point of the bathtub with the magnificent painting, which works through the complimentary antique nature of the pieces, both with gold details in the frame and fittings. The two coexist so pleasingly due to the unique coincidence that the width of the painting aligns almost perfectly with that of the tub. By choosing the artwork alongside your fittings, you too can include dramatic wall art in your bathroom. 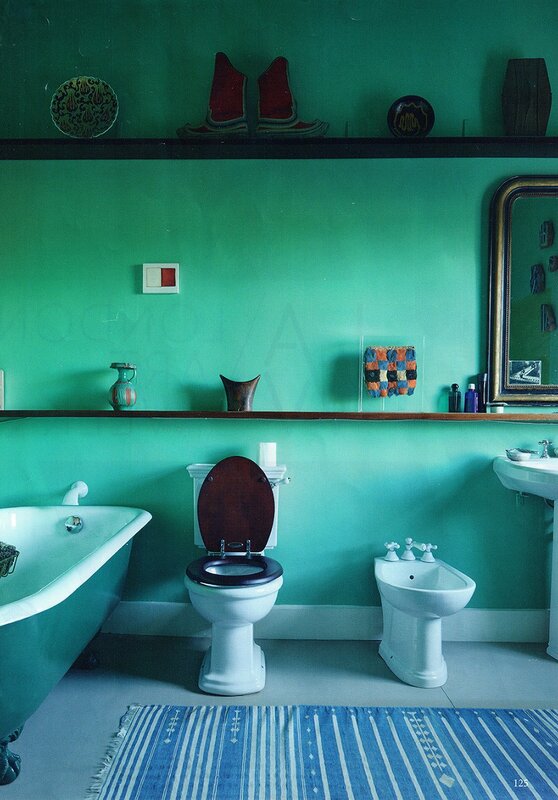 This bathroom designed by renowned British art collector John Kasmin, better known simply as Kasmin or “Kas”, is a brilliant example of how objects and sculpture can be incorporated into a bathroom space in a way that is both considered and without connotations of clutter. Shelves are a necessity to a bathroom to hold the ever increasing lotions and potions available on the market, and Kasmin has established a discerning method of fitting floating ledges to display the carefully selected objects so that they not only compliment one another, but also the toiletries that sit alongside them. 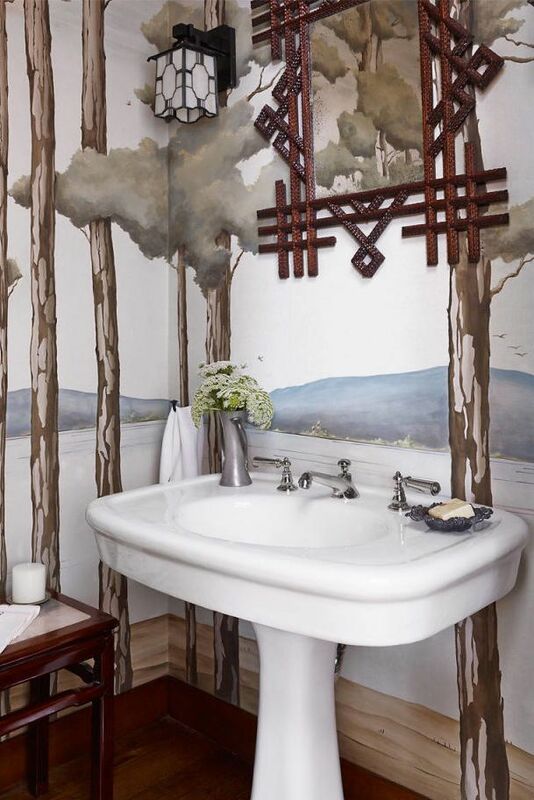 A space efficient way of featuring art in your bathroom is through lining the walls. This contemporary Southern California residence shows how flat-surface can make a big statement in the powder room. Unlike wallpaper which is made up of a repeat pattern and sold to the masses, a wall mural is a singular scene that covers the entire wall space, which by nature tends to be bespoke and more intricate in design. You might think of it as an all-encompassing, speculator work of art, which you could spend hours appreciating from the comfort of your bath.